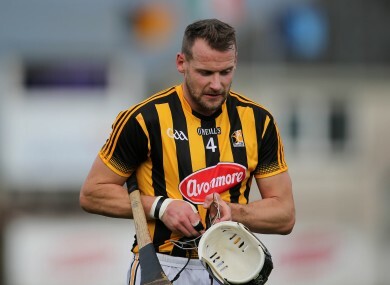 Kilkenny's Jackie Tyrrell missed the semi-final win over Waterford. KILKENNY HAVE LEFT the door open for Jackie Tyrrell to return from injury before the All-Ireland hurling final but time is against the Cats defender as he battles a stress fracture in his foot. Tyrrell missed the semi-final win over Waterford and last played in the Leinster final success over Galway. Last night Brian Cody refused to rule out the former Kilkenny All-Ireland winning skipper from his setup that will face Galway. “Jackie has a stress fracture and he has been in a boot for a few weeks. “He’s out of it now and it depends on how he recovers from that. We’re not ruling him in or ruling him out at the moment. He’s just working his way back now and we’re hoping he can get back running. “We’ve an open mind on it, he’s kept himself, he’s worked away in the gym, his fitness levels are massive anyway. “It’s a question of whether the injury will have healed sufficiently to allow him to do what he has to do. All of Kilkenny’s other injury concerns have cleared up involving Eoin Larkin and Ger Aylward while Richie Hogan will be available after being hampered by a back problem in the build-up to the Waterford match. Richie Power, who has missed the whole season, could also make a dramatic comeback from a knee problem. “Richie Power is pretty good at the moment, to be honest about it,” revealed Cody. “He’s training, and he’s worked very, very hard all year, he hasn’t got any game time at all this year because he couldn’t, he just wasn’t ready for it. “His ability to partake in training has picked up since the semi-final. Email “Injury battle continues for Tyrrell before final but better news on Power”. Feedback on “Injury battle continues for Tyrrell before final but better news on Power”.